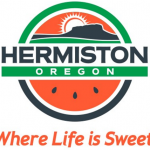 HERMISTON, Oregon – The Hermiston City Council holds its regular meeting tonight at 7. One of the items on the agenda is a request to lease an acre of land at the Hermiston Airport. Ross Brandt Electric wants to move to the acre of land. Currently, the company is in a former hangar building at the airport. The move would free up the hangar for another interested party. Over time, Ross Brandt will pay the city about $50,000 to lease the land. The council will also act on dedicating a right-of-way for 10 feet of land on the north side of East Theater Lane between Eighth and 10th streets. The move is essentially a property swap between the Hermiston School District and the Hermiston Irrigation District. The council will vote on naming five individuals to terms on the Eastern Oregon Trade and Event Center Advisory Committee, now that the city has taken over sole ownership of the facility. Lucas Wagner is nominated for a one-year term. Mike Kay and Vijay Patel are nominated for two-year terms. Steve Williams and Steve Eldridge are nominated for three-year terms. All of the terms begin July 1. The council will also hear a number of reports from various committees and a supplemental budget request.